Sure it is the Fourth of July, but in honor of another great US holiday, I made this “Time to the Five Minute” math center. Download this freebie now and you’ll have it in your files for the next school year. As a Navy Wife, it’s my little way of saying THANK YOU to all my followers and other military family and friends! Your kids will ♥love it! 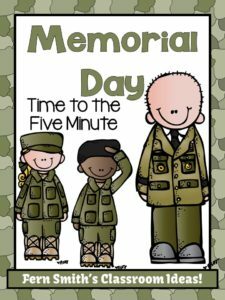 Would You Like Something to Review and Incorporate Time Around Memorial Day?